Cobra you were right, I simply dropped the axle from the driver side drop bracket/ got the radius arm to axle half bolt on then with the radius arm bolts loose and jacked up the axle beam back into the drop bracket. This has definitely been a pita, wish I had a lift but even then it still might have been extremely difficult. Does anyone use the factory bushing spacers in the radius arm? How tight to do you guys tighten the radius arm bushings? My bushings look slightly squished according to your pics Cobra. Cool, glad it worked out without ob-longing the hole. I broke off one of those ears and I'd hate to weaken it any more. I actually scabbed another plate on top of mine to add some strength. I'm using the Energy Suspension bushings and to be honest with you, I put them on with the 1/2" impact and I run around 175-180 psi, but I use the German torque specs: "GoodinTight". I do not use the white nylon piece with the Energy Suspension bushings. I think the factory torque spec is 120 ft lbs? Lol, “GoodinTight”. Based on your picture I’m going to loosen the bushing and get the torque wrench on it because mine are very squished, they are poly but I’m not sure if Superlift uses Prothane or Energy, almost the same thing but I do buy Energy over the competition whenever possible. My truck is up and running, now I just have to address the superman stance. I have a 4'' lift block in the rear but do you guys think a 5'' block will fix it or what AAL should I use? Shackle flip will be the future solution but for now I just need to get 'er level. I have a 12k pound winch that I need to install but I don't think the 80lbs will weigh the springs down enough. My grill is off because I installed a 4 bolt steering box and an aftermarket cooler on the condenser and I'm going to repaint the grill. 5" block is too much IMO. How much higher do you need to go in the back to get it close to level? The front will settle down a bit with use and an add a leaf will get you an honest 1-1.5"
I need to measure but I’m guessing two (2) inches. She looks weird for sure, not happy atm. Perhaps I should clarify; when I say a 5" block is too much, I don't mean for your truck to sit level, I mean that I personally would never go over 3", maybe 4" on a block. 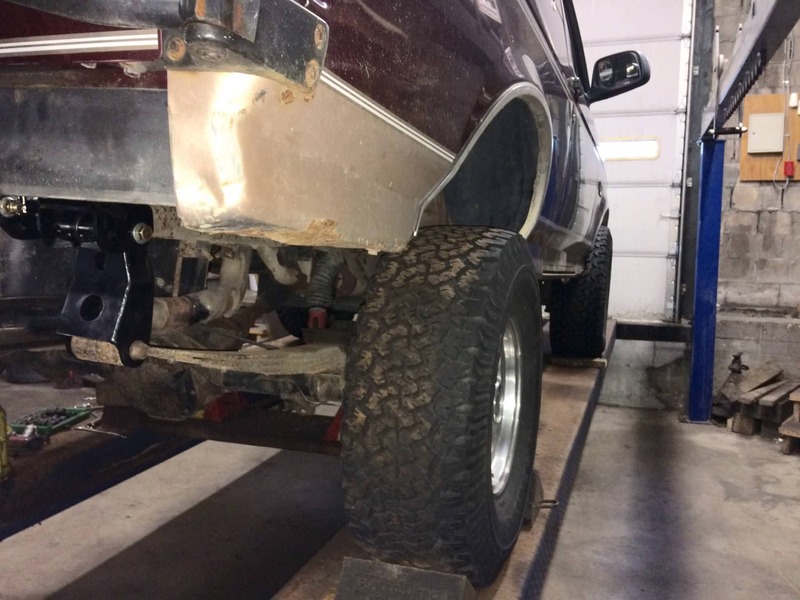 I understood you, the rear Superlift kit only consists of a 4” lift block so I’d either have to get a shackle flip kit and remove the 4inch lift block or use an aal. I was just wondering what aal kit you guys recommend to lif the rear to make it level with the front. If you are sitting that low in the back with a 4" block it is likely that the original springs are sacked out. 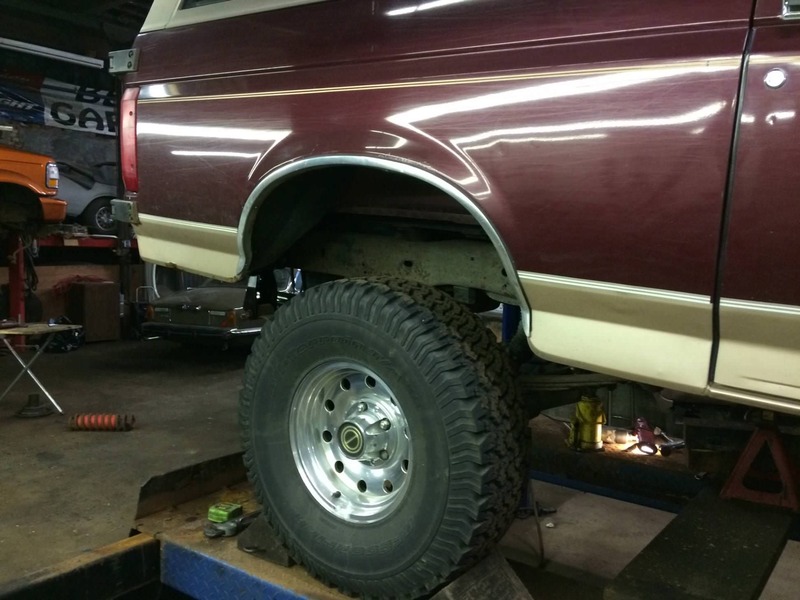 Most Broncos are 1.5 to 2" higher in the rear and the 4" block SHOULD have leveled it. Your rig sounds like a good candidate for new rear lifted springs. And the bushings that come on Super Lift arms are not the Energy ones. Energy bushings are much smaller than some of the other brands. .....or go the shackle flip route and then see what you need to make up the difference. Mine netted me a good 4+ inches, so you might get by with an add-a-leaf to make her level and help stiffen your spring pack. I ended up purchasing a BDS 2.5-3'' AAL from JBG for the rear to make the truck level. Hopefully it'll raise the truck more than I need so I can go down to a smaller block (currently running 4'' block). 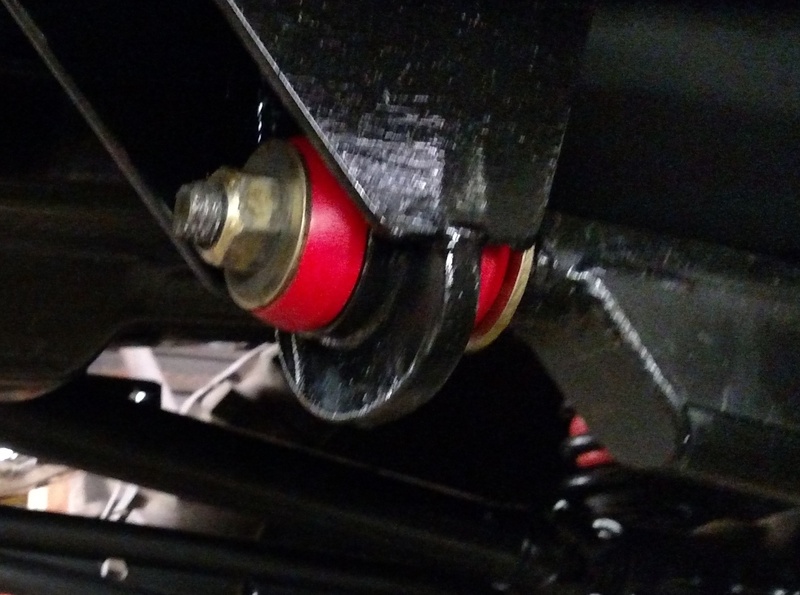 Do you guys typically use C-clamps to keep tension on the leaf packs when loosening the leaf spring bolt or is it safe to loosen the bolt slowly? I would use C clamps , there is a lot of built up energy in those springs. My procomp Stage II kit originally came with Dual AAL's for each side. running the stock wedge/block it was pretty level. I think in your case it will work out well. Do you think two (2) Harbor Freight 8'' cheapies would work? I'm sure they would; a vise will work in a pinch too. Might have to start a new thread guys, but I'm looking for some 9-10'' (Prefer 10'') wide wheels for my 8 lug swap (Need to be 17''s because I need to clear sterling 10.25 Disc brake calipers). 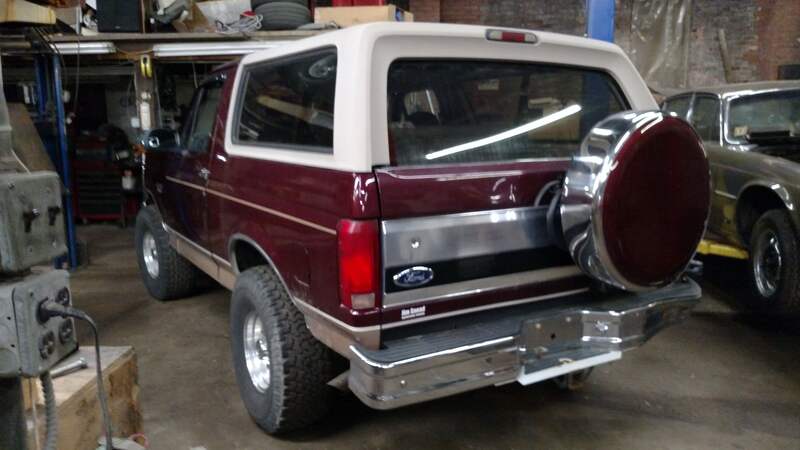 I want a nice steel or alloy military looking wheel (no showy alloy wheels), similar to the stock alcoas I have on now but can't find anything with 3.5 backspacing and want to avoid wheel spacers because this is a primary offroad/ street rig. why 10" wide? what size tires are you planning to run? 37x12.5x17. Want them to stick out further from the wheel wells to be more stable. Agreed, I run 15" x 15" on my 44's and "showy alloy wheels"
Cobra how are you able to clear 44s? Is it suspension and body lift + fender cutting, what’s your setup in a nutshell? Also there’s nothing wrong with showy wheels but it doesn’t match the look I’m going for. In the future I want another EB and that’ll be my show truck. No offense taken, just joking around. Hit the link My Build Thread , it's in my signature too, it might be easier than me explaining it to you. I'll be happy to answer any questions you have after or help you out any way I can.